Every major motorsport has an icon – the one person who personified the sport and became the focal point for appealing to the mass market. In stock car racing, it is Richard Petty; in Indy car racing, it is Mario Andretti; and in drag racing, it’s “Big Daddy” Don Garlits. 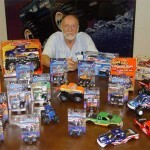 The monster truck sport has its own icon: BIGFOOT creator, Bob Chandler. He paved the way for his sport’s wide appeal. His achievements are even deeper, though – Bob is the only motorsport icon to “invent” his own sport! Bob spent his early years in St. Louis, before going to California, where he joined the Navy right out of high school. He served on a Mine Sweeper as an engine-man, visiting Japan, the Philippines, Hong Kong, and the South China Sea. 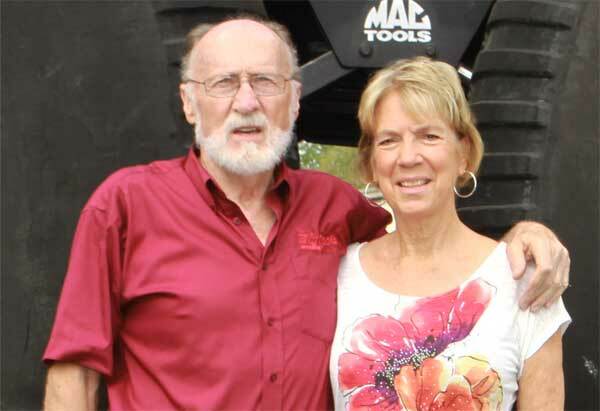 Upon returning to St. Louis, Bob joined his family as a carpenter and construction manager, meeting Marilyn and marrying in 1965. In 1973, a motorcycle accident looked to put an end to Bob’s construction career. 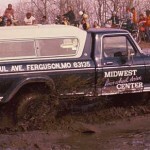 The next year, he ordered a 1974 F250 pick-up truck, and soon Midwest 4 Wheel Drive Center was born in the family garage. Neighbor and good friend, Jim Kramer, joined Bob, later becoming Vice President. Business was good, but they all still took time to go four-wheeling whenever possible. The Chandler family, which now included three children, soon started spending their weekends at off-road events and running the gravel-bottom rivers in southern Missouri. 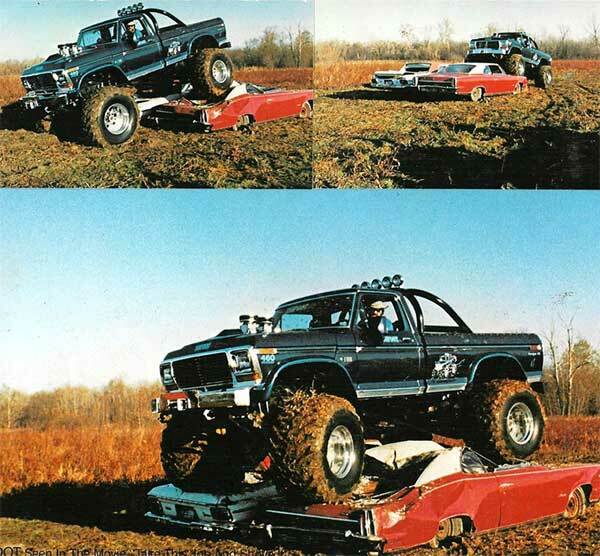 Due to Bob’s lead foot, the truck was christened “BIGFOOT.” To try to keep down on breakage and to show off 4-wheel drive products sold by MW4WD, Bob added bigger axles, but he soon followed them with bigger tires, again requiring even bigger axles. BIGFOOT just kept getting bigger and stronger. Rear steering was another especially popular innovation, and soon BIGFOOT was attracting attention wherever it went! In 1979, BIGFOOT performed at its first paid event, a Denver car show. 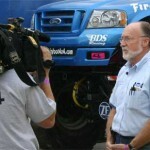 Exhibition truck pulls in arenas and stadiums soon followed. Magazines came calling and BIGFOOT’s popularity continued to grow. Never one to rest on his laurels, Chandler then tried something that really caught the public’s imagination – he drove BIGFOOT over a couple of junk cars! A promoter saw a taped copy of the aptly named “car crush,” and a few months later Bob duplicated the stunt in a stadium show. Because of the growing popularity of BIGFOOT, Chandler cloned BIGFOOT in 1983 to try to meet the demand! 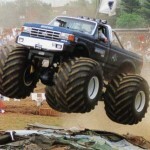 In addition, inspired by the success of BIGFOOT, numerous imitators came forth and the “monster truck” name was coined. An industry was born. There are now hundreds of monster trucks throughout the world. After a few years of simply crushing cars at events, the next logical move for the industry was to start racing, which quickly replaced everything else. Chandler and the BIGFOOT Team quickly proved they were up to this task, winning the vast majority of the events they competed in. As technology developed though, a change was needed. 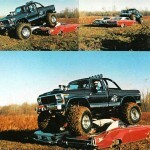 With the help of computer aided design (AutoCAD), which Bob taught himself, BIGFOOT immediately leaped to the forefront in the development of a new generation of race monster trucks. These trucks came to feature a radical new tubular chassis design and patented cantilever-based suspension systems that represent the current state of the art in race truck design. 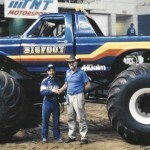 The first of these trucks was BIGFOOT #8, built in 1989, which became the 1990 World Champion. In 1992, Chandler became the first to utilize the team approach to racing, and BIGFOOT #10 and Snake Bite (BIGFOOT #9) raced to a One-Two finish in points. In 1993, Team BIGFOOT took first, second and fourth, and improved to a top-three sweep in 1994. Since then, Team BIGFOOT has won first or second place almost every year in various points’ championships, including the current streak of 6 straight of the esteemed Toughest Monster Truck Tour Championships! To date the team has won a total of 50 championships. 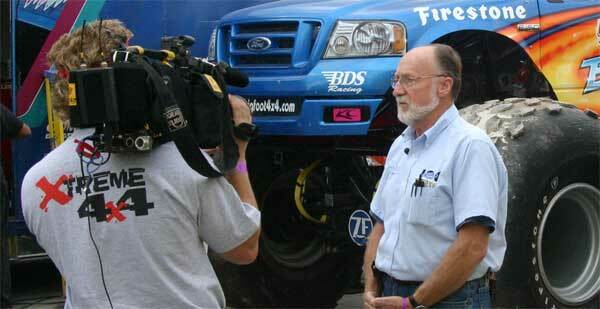 Over the years, Bob and his BIGFOOT crew have also been the sport’s safety leaders. 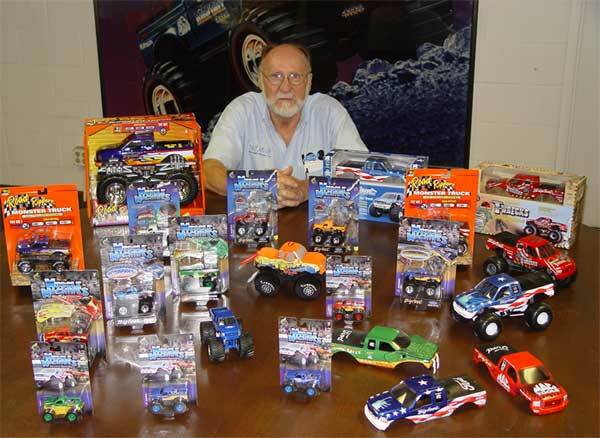 In 1987, Bob co-founded the Monster Truck Racing Association (MTRA), an organization created for the sole purpose of promoting safety in the monster truck industry. Until his recent retirement, Bob had led the organization and he continues to be a driving force behind many of its safety rules. One of his most important safety ideas was to adapt the use of an RII (Remote Ignition Interrupter or “killer” radio), now standard in the industry, to allow a monster truck’s ignition to be shut off by remote radio signal. Year after year, with the continued help of Jim Kramer and the rest of the BIGFOOT crew, Bob has kept BIGFOOT ahead of the crowd with his creative ideas. Team BIGFOOT has appeared in almost every major stadium and dome around the world. BIGFOOT has visited 26 countries and been in seven movies starting with “Take This Job and Shove It” in 1981 and, more recently, “Charlie’s Angels Full Throttle,” where Drew Barrymore drove BIGFOOT #15. 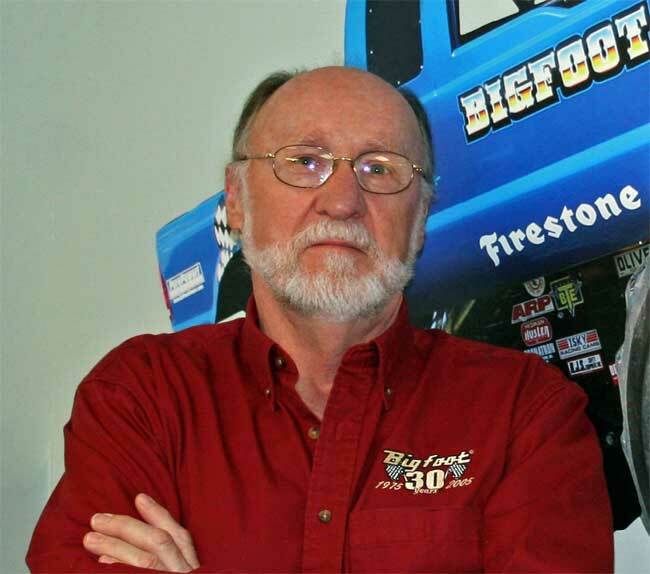 Bob has already been inducted into the Missouri Sports Hall of Fame, the Off-Road Motorsports Hall of Fame, and was unanimously inducted into the first class of honorees in the International Monster Truck Museum Hall of Fame. Bob and BIGFOOT have appeared in hundreds of TV shows, including shows on the National Geographic Channel and the History Channel. Firestone, Summit Racing Equipment, Odyssey Batteries, Lucas Oil and the “who’s who” of automotive aftermarket companies now sponsor Team BIGFOOT, which currently includes competition, exhibition and display vehicles. In 2012, the BIGFOOT team took a huge leap forward in technology and innovation when BIGFOOT #20 was completed. It is the world’s first and only battery-powered monster truck! It runs on an electric motor powered by three banks of 10 Odyssey Batteries (30 batteries total for power) putting out 360 volts! There are an additional 6 batteries that power the steering and brakes. Most recently, BIGFOOT #21 was added to the fleet, being the most technologically advanced monster truck in competition today. 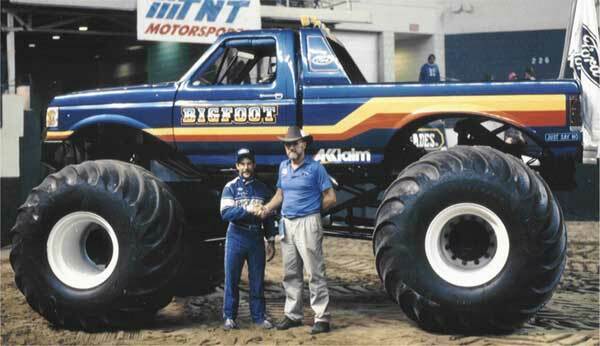 Bob’s wife, Marilyn, is co-owner, and the first woman to drive a monster truck, BIGFOOT, of course! The Chandler children, Ann Trent, President of BIGFOOT, Penny Chandler, her Executive Assistant, and Bob C., Licensing/IT/Sales Manager, are all following in their parents’ footsteps. Bob Trent, Ann’s husband, is in charge of sponsors and the BIGFOOT crew, making BIGFOOT a true family business and bringing the sport into the next generation! 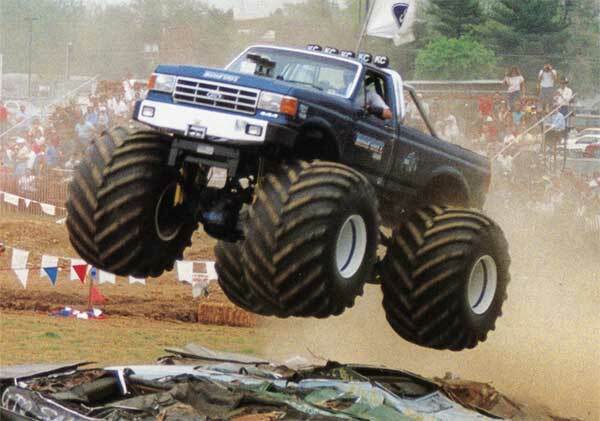 CLICK HERE for a more detailed history of the BIGFOOT monster trucks.